Like most things in life, the type of carpet you choose for your living room would reflect your personality and style to a large extent. In effect, living room carpet ideas are all about personal taste. But while introducing a dash of your personality to your living room via the carpet, comfort and style should never be sacrificed. The choice of carpet must, therefore, be welcoming and exude warmth. After all, the living room is the major center of activities in the home. It is the place where friends and family usually assemble to relax, play, chat, watch movies, etc. The choice of carpet is also dependent on several factors like traffic, the decor of the house, and the presence or absence of kids and pets. Before looking at trending living room carpet ideas, a few words about the things you ought to consider in getting a carpet for your living room. Durable – Generally, the living room gets the most traffic. This makes it imperative that the carpet is durable enough to withstand the expected wear and tear related to people and pets traversing the area. You measure a carpet’s durability using the density rating, face weight, and tuft twist. Look for a carpet with a density rating of at least 2000; tuft twist of not less than 5; and at a face weight of between 30 and 40 oz. Also, if you don’t want to be vacuuming more often, avoid staple fibers and go for Bulk Continuous Filament (BCF) carpets. The former sheds easily, therefore it is not as durable as the latter. Color – Though the color is subjective, the best colors must complement the decor of your living room, the room’s lightning, and the color of the furniture. 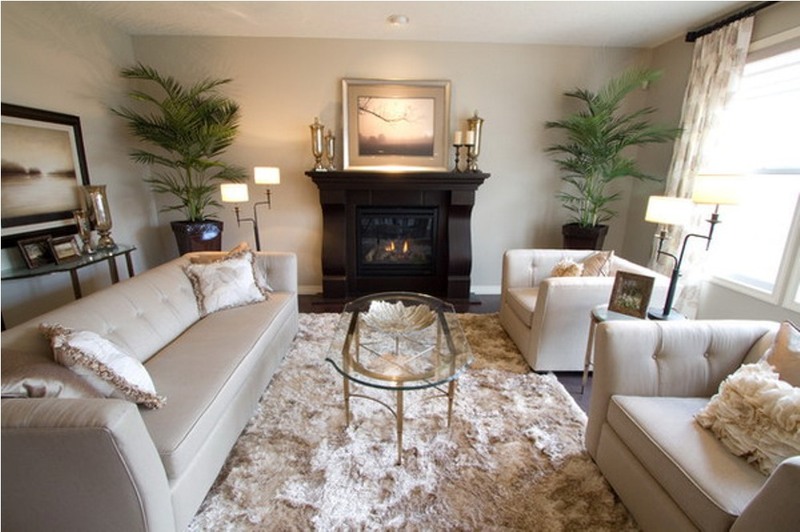 If you want your living room to look bigger, your shades of carpet should be on the lighter side. The choice of dark colors should be considered if you want a cozy and warm atmosphere, especially in a colder climate. That said, the color choice must have at least two of your accent colors. Cleaning and maintenance – As one of the rooms that experience the most traffic, spills, dirt, stains occur here more often. Only the kitchen can match the living room in this respect. If it is available, purchase a living room carpet that offers a lifetime warranty for stains with a ‘no exclusion policy’ that to cover stains from pets, accidents and bleach. Size – Choosing the wrong carpet size is capable of undermining the overall effect you wanted to create in your living room. Carpets that are bigger than the living room make the space look smaller while small carpets give the impression of a hurriedly-done, shoddy decoration. If your budget can’t accommodate the whole living room, get a size that exactly fits the seating area of the room. Comfort – You’d want a carpet that is soft to lie on if you or the people in your inner circle spend a lot of time lounging on the floor to watch movies, play games or simply to seep. There are no limits to living room carpet ideas because of the array of colors, types and carpets styles available. DIY interior decorators love this fact about carpets. The ideas they can come up with can be breathtaking and sometimes look like the concepts of professionals. To many folks though, the versatility of carpets can leave them stumped on what combination of colors and styles is the best fit for their living room. If you are in that ballpark, the following are some living room carpet ideas you could use. Until recently, the use of carpet tiles was mostly restricted commercial spaces only. Now though, it is hot as a viable carpet idea for the living room. The carpet tile is awesome for households with lots of kids and pets where spills and stains are unavoidable. Here is where this carpet idea beats other living room carpet ideas: you don’t have to replace the whole carpet because of a bad stain or damage to a spot. Simply remove the tile and replace it with another one. Another cool aspect of carpet tile is you can easily install it yourself and you can create intricate patterns with differently-colored carpet tiles to suit your taste. If you think carpet runners are still restricted to narrow spaces and hallways, think again. Because of the popularity of hard floors, people now realize they can spice up a monotonous hard floor with a carpet runner in the living room especially around the sitting area. What makes carpet runners a great idea is that you can opt for bold colors and jazzy patterns in a limited area without making the whole living room look like a clown’s tent at a circus. The cost of carpet runners can put a dampener on one’s enthusiasm. But, it would be worth it to make the sitting area of your living room really stylish with them. The trend in home design is to blend the living and dining room areas. The best carpet ideas would seek to blend both areas and while giving them unique identities. Using distinctive colors for both areas is the best way to couple the two spaces together. You could choose a totally different pattern with the same colors for each area or a shared color for each carpet. The cut and loop carpet idea is a combination of two types of carpet: the cut and loop carpet. Cut and loop carpets can be easily identified by running your hands across the surface and feeling the contrasting textures. With this carpet idea for the living room, you’d be able to customize your carpet just the way you want it. The end result is a bold statement in style and uniqueness. These carpets are making a strong comeback in living rooms after going off the radar for a while. The carpets are recognized by their almost curly surface because creating the unique surface involves twisting each piece of the carpet several times over. The current trend in frieze carpets for the living room is inspired by the texture of shag carpets. They are comfortable to walk or lie on and with carefully chosen color to match the walls or furniture, you can cover the whole living room area to achieve a stylish and contemporary look in your living room. When it comes to color ideas for choosing carpet in the living room, the most popular trend are any of bright, bold, gray, and pastel blue colors. Bright bold colors – These color schemes are awesome for the younger generation. The idea is to make the carpet standout without being simply a neutral backdrop for the living room. This idea explores the theme of incorporating carpets into home designs. To pull this off with panache though, it is recommended you cover just a small area instead of the while living room. Gray – Gray is now a popular color in almost all household items. This gray fad can also be found in carpet ideas for the living room. There are dozens of shades of gray you could choose from and still look stylish. That is why it is such a hot color now and in the foreseeable future. What makes gray acceptable to all? In whatever shade, it exudes a cool and contemporary atmosphere in the living room. In addition, it gives you a neutral backdrop to decorate the space with any color you want. Pastel blue carpets – You could argue successfully that faded blue colors are a shade of gray and vice versa. Blue carpets ideas in addition to some of the good qualities of gray carpets, add calm and serenity to the living room space. Blue carpets have the added advantage of working perfectly with gray decor in the living room and are versatile enough to give you a wide array of options. It is not surprising people of all ages love the color as a carpet idea. 2019 and the future will see exciting, eye-catching carpet layout and patterns. The trends among the younger generation are patterns that are fun but; the traditional patterns favored by older and conservative people are still very much around. Some specific patterns for living room carpet ideas include the geometric carpet patterns incorporating Moroccan trellis designs and hexagon carpets. You could give those a shot. The best living room carpet ideas should be about comfort, style, and pattern that complement the overall decor of the living room. When it is perfectly executed, the soothing feeling you get cannot be matched by any other flooring option. It is obvious that the options available to you are only limited by your imagination. With several styles and design-combo as options, there are the shades of gray living room carpets that cut across demographics, to the bold, fun and intricate patterns favored by the younger generation.